Omar Spahi and Terry Huddleston are comic book creators without the greatest of followings. Yet. Omar had only on response on his Reddit IAM. Terry doesn’t have many followers on DeviantArt. The Facebook page for their new comic, Thaniel, is rather bare, without comments. An article showing off artwork on Bleeding Cool over Christmas got… no comments. But this might be all about to change. 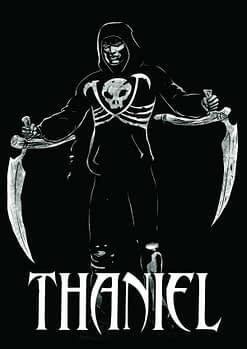 In April, Ossm Comics will publish the first two issues of Thaniel through comic book stores, a four issue mini-series, with the remaining issues in May and June, just in time for San Diego Comic Con. Throughout the universe there is one constant; everything dies. Growing up on the streets, losing everyone closest to him, Thaniel knows this harsh reality all too well. 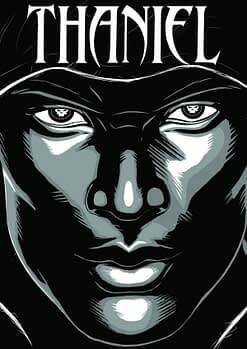 Born with a mysterious power that he’s struggling to control, Thaniel begins to wonder if those he loves are gone because of him. After discovering the person behind the drug trafficking in his city, Thaniel’s forced to use his power against someone he cares about. Every decision he’s made, every tragedy he’s faced was only a precursor of what’s to come. Delivering others from evil comes at a price. Left for dead, Thaniel begins to see the potential limitlessness to his new powers. Using his godly gifts to stop his best friend, Thaniel causes the real mastermind to emerge from the shadows. 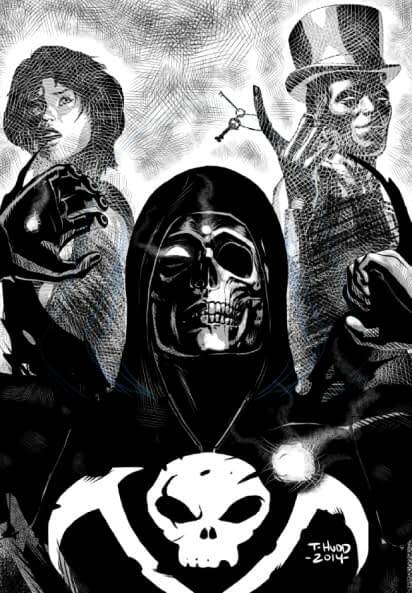 Death, the Grim Reaper himself, has a plan, and Thaniel may be forced to execute it. Known as THAN to his few close friends, every time THANIEL tries to do the right thing, bad results are his reward. Growing up without a father, losing his mother as a teenager, too emotionally broken to keep his relationship with the girl he loves, and a high school dropout, to say THANIEL’S had a tough life is an understatement. Continuing the trend of nothing going his way, a strange entity passes on a unique power to THANIEL, unbeknownst to the young man. Equipped with a fraction of the most powerful ability in the universe, THANIEL tries to use that gift to even out the bad that has occurred in his life. But like all the roads he paves with his good intentions, they only lead to one place. Every broken person needs a rock in their life, someone to keep them grounded when the whirlwinds are relentless and unforgiving. Friends since childhood, MACKENZIE has always been there for THANIEL. She’s the one consistently good part of THANIEL’S life, but he’s too afraid to hold on, afraid that he’ll lose her along with everything else. MACK is strong, passionate, understanding, and even after being pushed away for years, when THANIEL needs protection from the endless nightmares that follow him around, she stands firmly by his side. Where THANIEL has pushed away all the bad things that come his way, CARY has learned to embrace them. A quiet kid in school with his head always in the books, CARY turned down a more violent road after graduating. Seeing it pointless to fight against the inevitable for young men like him in their neighborhood, CARY adapted, not only becoming a product of his environment, but becoming a leader within it. He and THANIEL have fallen out of touch with one another over the years. Where THANIEL self-destructed on his own, CARY self-destructed with a much larger blast radius, affecting their town in a way THANIEL has yet to discover. Like all good things in THANIEL’S life, CARY began as something good, and now has become something very, very bad. A being that has existed before God, before the Big Bang, before everything; DEATH is the antagonist of the story. With the ability to take any shape, be anywhere, and reap everyone and everything, he makes a formidable enemy for anyone to battle, especially a kid from the streets. DEATH must be in every place, at every time, in order to take souls to the next plane of existence. If he should ever be still, every not be omnipresent, nothing in the universe would be able to crossover; nothing in the universe would be able to die. He has spent a millennium trying to execute a very specific task, one he now stands on the very eve of its success. Having twisted time and space, reaped certain people to create a specific bloodline, and manipulated the other three so called “horsemen,” DEATH’S plan all comes down to THANIEL and a choice he must make.